The total value of global merger and acquisition deals involving U.S. targets reached $154.4 billion in January, the strongest start for any year since 2000, according to Bloomberg data compiled by Bloomberg Law. The first month of 2018 saw a 68.4 percent increase over deal volume in January 2017, when aggregate deal value was $91.7 billion. However, this year’s figure was still well below 2000 levels, which reached an record $264.9 billion. That figure in part can be attributed to Time Warner Inc.'s $124 billion acquisition of America Online Inc. At the time, it was the biggest merger in U.S. history and the second biggest worldwide. January is typically a slow month for M&A as companies are setting their budgets for the year and reviewing the activity of the past year. 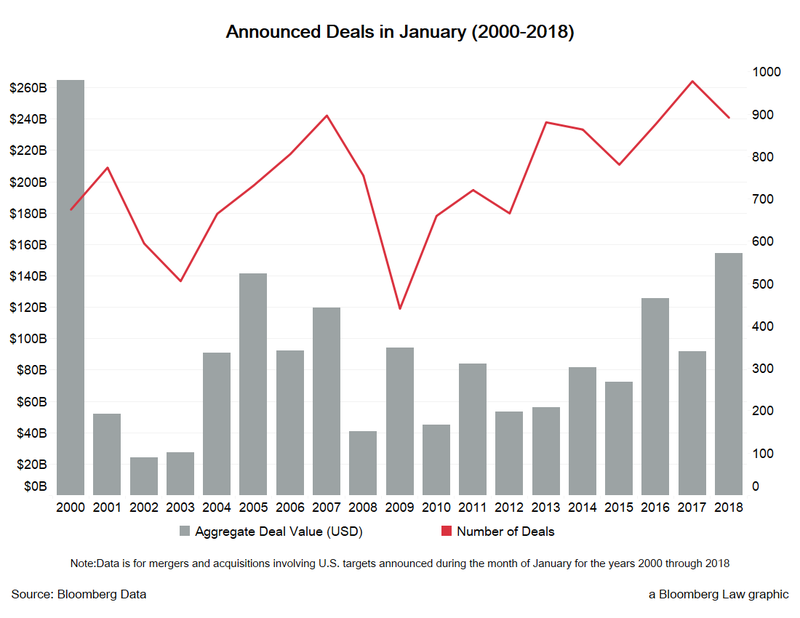 The number of deals — 892 — announced in the first month of 2018, is actually higher than in January 2000, which saw 675 deals, Bloomberg Law’s analysis shows. The biggest deals announced in January include FUJIFILM Holdings Corp.’s $10.5 billion bid for a 50 percent stake in Xerox Corp. and Keurig Green Mountain Inc.’s $23.2 billion plan to buy Dr Pepper Snapple Group Inc. The recently enacted tax overhaul, which went into effect Jan. 1, is among the factors expected to drive more deal activity this year, practitioners said. One big change made by the 2017 tax law is in how cash stashed overseas by U.S. companies is treated. Companies such as Apple Inc. with massive offshore accounts can now bring that money into the U.S. at a 15.5 percent tax rate, much lower than the prior rate, which was around 35 percent. Last year wound up being solid for M&A, but political uncertainties in the early months about U.S. regulation in a new administration and Brexit caused mega-deals to take a slight hit, Kucera said. M&A activity began to creep up toward the end of 2017. The tax legislation, even though it wasn’t finalized, helped to ease the uncertainty that had been holding companies back, practitioners said. “We’ve seen some evidence of momentum, and I think that’s going to continue,” Michael Szlamkowicz, who advises on deals in the New York office of Hogan Lovells LLP, told Bloomberg Law. There’s a “fair amount” of money available for deals both because of cash that investors have been sitting on and repatriation benefits of the tax overhaul, he said.